I am also indebted to retired West Yorkshire Police Inspector, Kevin Robinson, for helping me check the police procedural details in the story and responding to my endless questions with so much patience. This is another crazy, funny and thrilling murder mystery by H. Y. Hanna, but what makes it stand out from other similar books for me is the beautiful way she describes Oxford. Oxford is obviously very dear to her and I am sure that if I ever went there I would have so many deja vu moments because of these books. This is the second novel of the Oxford Tearoom Mystery series where you return to the picturesque village of Meadow-on-Smythe and all the colourful characters that have once again settled back down to their daily lives. 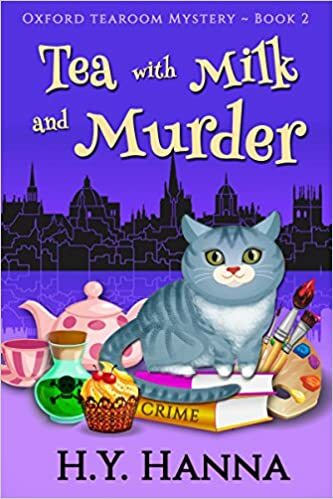 It isn’t long before murder, mystery and mayhem return to Oxford and Gemma finds it as irresistible to get involved in, as the customers of the Tearoom do with her mom’s delicious Velvet Cheesecake. The scene is set for a hair raising and hilarious adventure involving the super sleuth little old ladies turning up in the most unexpected places and Muesli the cat being a fair judge of character. The first word that came to my mind after reading the second book “Tea with Milk and Murder” of the Oxford Tea Room Mysteries was phenomenal! This mystery series is one that all of you cozy mystery lovers out there do not want to miss. However, I do suggest starting with the first book “A Scone to Die for. Hsin-Yi has an extraordinary way of bringing one into the story making you feel as if you are actually there walking the streets of Oxford University with the all of the 3D characters. This story centers around Gemma’s friend Cassie and her artwork. Gemma, with her mother (who has just discovered you can purchase merchandise on the internet), the four old biddies, and Muesli, all help detective Devlin O’Connor solve the murder. The story is full of twists and turns that keep you on the edge of your seat guessing ‘whodunnit’ right until the end.